In the classical setting of the Carlo Riva marina of Rapallo (Genoa, Italy), a pleasant and modern yacht catches the eye. 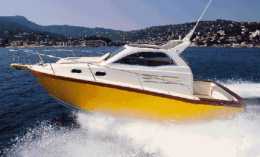 It is a cabin motor boat with the yellow gelcoat of the same hue of the taxis that fill the streets in Italy. Her name is written on the aft transom: Taxi. It is not a public means of transport but an ironical interpretation of the most recent production of Portofino Marine. This small attractive cabin cruiser may be requested with yellow, gentian blue or opal green gelcoat. We tested the boat on a sunny day, when the yellow hull best contrasted with the intense blue of the sea and of the sky. The boat not only caught our attention for her hull color, but also for her excellent cruising performance and her overall construction characteristics. Fitted with two 185-hp Yanmar diesel engines, she exceeded the 30-knot mark and is very comfortable. On deck, the cockpit is extensive and is connected to the dinette and the helm station. Belowdecks the interior is simple and with workmanlike finish and the forward cabin is ample, with very pleasant upholstery and wood finishing. Draft below the propellers: 2'2"
Total engines weight: 2x773 lbs. Standard equipment: swimming aft platform, cockpit, solid teak side decks, cockpit stringer and gunwale in solid teak, folding swimming ladder, night lights on side deck steps and inside cockpit, dockside electric connection, electric shock saver, echo- sounder, windshield cover, electrical toilet, luxury interior finishing, crystal mirrors in forward cabin and bathroom, complete weather station, dinette table with pneumatic piston, Hi-fi stereo. Optional fittings: trim correction control with electronic indicators, fresh water heater and shower, mechanical or hydro- electric gangway, automatic pilot, GPS, safety equipment, 4 fishing rod-holders, forward sunning cushions, aft awning, transportation and launching in Lavagna. Price with test power: Lit. 190,000,000 ex VAT (Lit. 165,000,000 ex VAT with 2x140 VM and basic fittings). 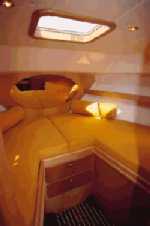 Layout and characteristics belowdecks: cabin access amidships through a two-panel wooden folding door, light interiors with cherry and marine wood linings. Access to the cabin through a changing room with hanging locker and electrical plant is noteworthy. The forward cabin is roomy and it includes the bathroom with sufficient space and full headroom. Deck characteristics and layout: 4 mooring bitts, 2 aft fairleads with inside mooring bitts, aft hatch with access to the aft platform, side decks access steps, L-shaped dinette (in two versions) with opposite a covered locker/sink. The dinette/helm station may be closed with a dodger. Forward, there is the pulpit and the anchor chain roller.